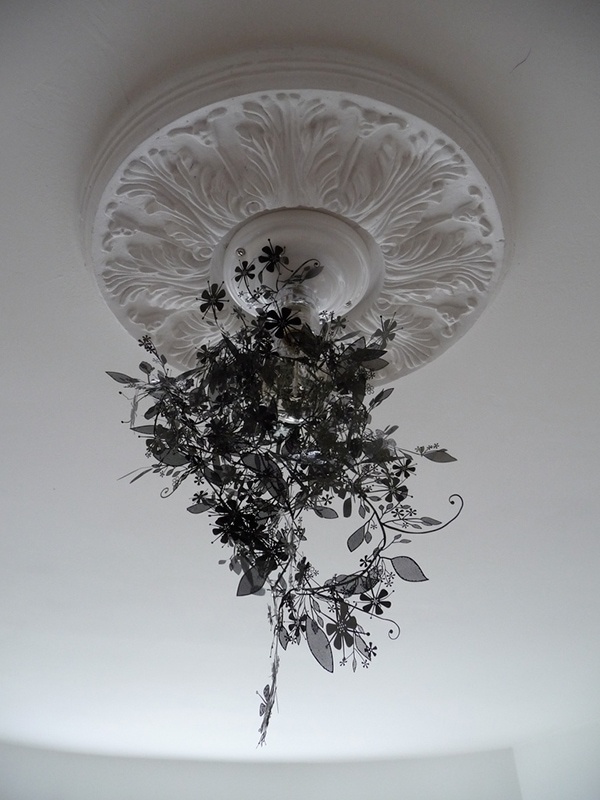 I’ve had a Tord Boontje Garland light (this is the black chrome finish) for several years, but for the most part it’s just been sitting in a tangled clump in a box since we moved into the house. The standard way to hang it is on a bare bulb suspended by a cord, but with our high ceilings, the proportions wind up looking really skimpy and just too dangly. After spending a solid hour detangling the thing last night, I decided to try wrapping it directly around the bulb on a flush-mount fixture in the bedroom. This is the white porcelain Benedict light from Schoolhouse Electric. The glass socket is really beautiful, so I wrapped the Garland just low enough that it’s still visible. I’m really happy with the result, and I can’t wait for it to get dark enough to check out the shadows it casts on the ceiling! I used an Edison Double Loop bulb for added effect (the light cast by Edison bulbs is very warm, dim and soft, and the bulbs themselves are beautiful—they’re perfect for mood-lighting in fixtures that have visible bulbs). The Garland itself is quite affordable, and I think it’s worth upgrading the light source to something more elegant than the standard plastic cord set that comes with it—in fact, you can even order the Garlands by themselves ($76 with cord/$64 without); you’re not obligated to order the cord set. If you want the effect of a hanging pendant, the Lewis fixture from Schoolhouse Electric (with a cloth cord!) would look fantastic. By the way, “arranging” a Garland light so that it looks like the product photos is a total nightmare. It takes FOR-EV-ERRR. This post (which I found in a fit of frustrated Googling) sums up the experience quite accurately! EDIT: Oooooh, nighttime shots! I’m in love. 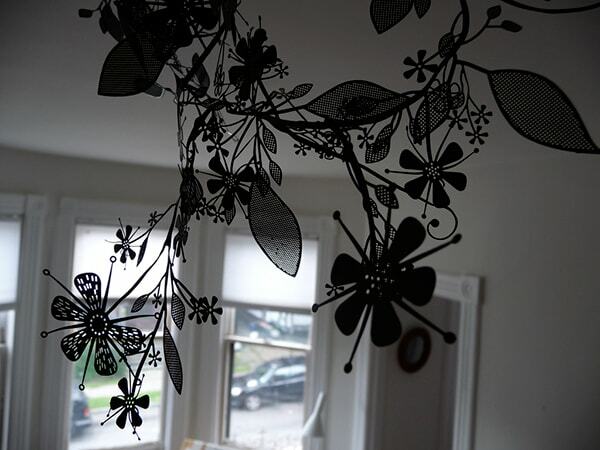 The shadow effect is so dramatic with the Garland this close to the ceiling! The moth-to-flame feeling of this light is perfect for summer nights, isn’t it? Sometimes “good enough” is good enough. 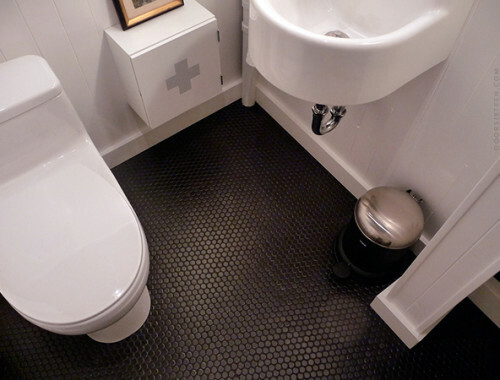 FAQ: What’s it like having a black bathroom floor? Five years ago, part three. This looks so cool, the whole package. I love your attention to detail. Can’t wait to see some night shots! Wow that is beautiful Anna! I can’t wait to see the nighttime pics. I’m going to read up on this light! lovely! looking forward to nighttime shots (though i read that as nightmare – what is wrong with my brain?!) and the bulb is really beautiful. ahh SUCCESS! It’s a great feeling when you’re done isn’t it? And how thankful are your fingers?! It looks fab! Thanks for the link – also nice to know I wasn’t alone experiencing the frustrations of garland-light-installation! This is staggeringly gorgeous! These garlands look a zillion times more interesting when they’re paired with a Victorian ceiling fixture. And the black is amazing. I LOVE the Garland light!!! I bought a golden one, but I haven’t installed yet because my apartment is being painted. I had so much work to buy this light!!! Here in Brazil is not easy to find it and it costs around US$ 200-250.Pretty expensive considering the material it is made of, but I love Tord Boontje’s work (especially the Garland light). You should go to http://www.nanimarquina.com and see the rug Boontje designed for them. I love the green one. So beautiful!!! It is called “Little field of flowers”. Wow, that looks great Anna. I think using the different fixture underneath was a stroke of genius, it really makes it work for your space. I am in love with the night time pictures! Very nice. Damn, girl…that works. So well executed, of course. that looks amazing. Is it actually sitting right next to the bulb, though? What is the garland made of? I’d be scared about something melting. wow, that is an amazing light. it looks perfect. Wow, I love the dramatic end result. Great job. It looks really beautiful! (And perfectly dramatic at night time!) I’ve been wanting the gold or silver one for our bedroom light. Oh mercy! I’ve had such a crush on these for so long, and you may have just now convinced me to save my pennies and get one. I want mine in that same finish! wow! this is gorgeous! i haven’t seen anything like this anywhere! thanks Anna! Am currently gleefully ordering one off ebay; I hope you don’t mind having your ideas shamefully ripped off. Wow. That looks totally beautiful. I love the night time shots. My Garland is the bronze one from Habitat which is much cheaper than the Artecnica one. I have no idea what the difference is except for colour selection. Tuija: The only difference is that they’re much cheaper in the UK! Unfortunately, we don’t have Habitat here – and they don’t ship overseas. it turned out brilliantly! i think anytime it got dark outside i’d find myself laying back and enjoying the shadows. Tara: The amount of light it gives off is dependent on the wattage/type of bulb you use. Edison bulbs are VERY dim, so you probably wouldn’t want to use one as a direct light source. The maximum wattage of both the Benedict and Lewis fixtures from Schoolhouse is 100W, though, so you can really put any bulb you want in there. I personally don’t like compact fluorescents in non-utility areas (especially if the bulb is visible), but a plain frosted or clear bulb with no printing on it would look just fine and give off quite a bit more light than the Edison bulb. Also, I imagine the silver and brass finishes would be quite a bit more reflective than the black and white versions, so that’s something to keep in mind in terms of desired “sparkle factor” in your dining room. The other thing to consider is the scale of your table in relationship to the Garland. If your table is large, you might want to get additional Garland(s) to make the light more substantial. You wouldn’t need to have extra fixtures, you can just layer the Garlands on top of each other. I’ve seen this done, and the effect is very dramatic! how nice! I’m in love too!! I love how this looks, especially at night! Every time that I see someone else’s in a different color than mine I wish that I had chosen… well, black today! I’ve tried this garland in about every way possible, around ceiling lamps, table lamps, and just as a garland. It is currently wrapped in paper in the closet. Yours looks amazing and the nighttime photos are stunning. Oh my, the whole effect is absolutely amazing! I love when various elements come together to create something completely new. Gorgeous. Totally jealous. I so want one. If you ever get tired of it, would you send it over to my house? Thanks. I wanted to write and tell you about a new website for fashion designers, artists, musicians, and filmmakers: www.PutItOn.com. 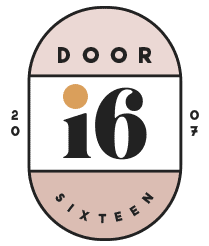 I’ve been using the site as an artist and have my work there, and am trying to support. Basically, the site allows artists from all over the world to connect, display their portfolios, and sell their work (with no commission taken). The site gives artists a free gigabyte of space to showcase their portfolios, allows you to stream audio and video works, lets you create live personal broadcasts, and translates any writing into ten different languages. If you could take the time to visit the site, and if you like it too, let your readers know about it, and even sign up yourself or link to it on your site it would be greatly appreciated! We are trying to make a go of helping out artists everywhere and are trying to get the word out, so please help us out if you like the site after checking it out! Hi there… I love the garland – I have 4 myself in my house… BUT!!! I cannot BELIEVE how much it costs in the USA! Here in England it is £15, or £28 in US currency!! that thing is a-mazing. i cant imagine the detangling process though. i’d go insane. i go insane just trying to detangle my necklaces. but the effect is gorgeous! Your version of the garland is just gorgeous. How do you imagine keeping it from becoming a haven for dust bunnies? It seems like after a year or so things might get dusty. But maybe we’re just dusty folk in our house. Or maybe it burns off by virtue of being so close to the bulb? I’m curious. I’ve been digging those simple bare bulb sockets over at schoolhouse and have been toying with the idea of using them or the cloth cord pendants for my bathroom. I love how spare and minimal they are, but wonder if without anything on them (like the garland) that they may seem a bit harsh in my retro bathroom as opposed to a really minimal clean space. They look fab with the ceiling medallion and black garland! 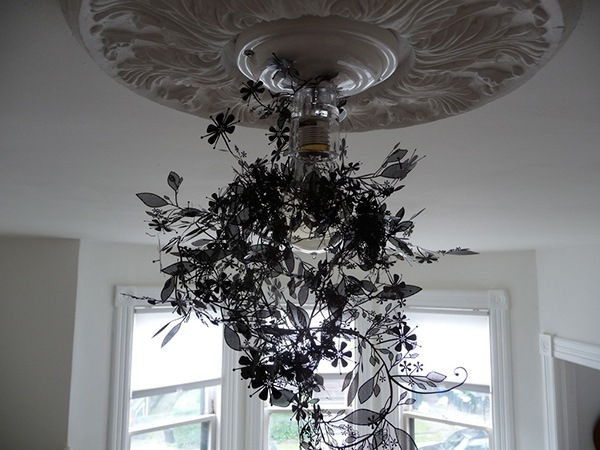 the end result is totally amazing — what a great makeover on your fixture! My husband is not a fan of the Tord garland sadly (too “girly” for him), so I’m admiring from afar. oh I have loved his designs for years, but was never crazy about the hanging bulb! Genius! Thanks for sharing, its truly, truly lovely! so pretty – i love this in black chrome! it looks freakin’ rad! love it. thanks for the awesome links. thank you for posting this! 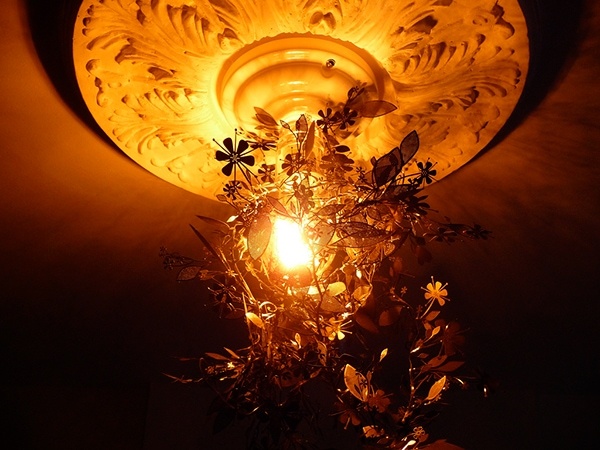 have been trying to convince husband of the garland shade’s awesomeness and your pics did it! will be stealing the look as soon as I get organized enough to do so. 1) that glass socket really is beautiful, and 2) i totally agree with the wrapping vs. hanging idea, great job! but this garland light is so trendy passe overdone. i didnt expect this style of light from you even if tucked away for many ayears. surprising. Anna, the nighttime photos are beautiful! Vanessa: Hah! Oh, I really couldn’t care less if something in my house is “trendy passe overdone”! I like what I like, regardless of its popularity (current or otherwise) – I really don’t worry about that. 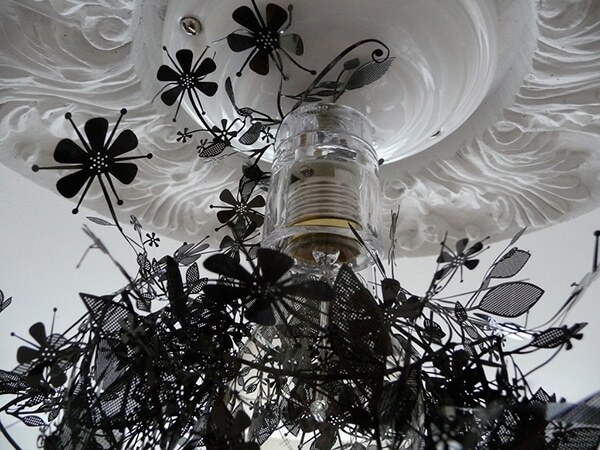 I love Boontje’s work, and this is my favorite of his lamps. Are you of the mind that we should all throw away our belongings as soon as they are a few years old? Or do we just get rid of them as soon as we see them in too many places? Good design doesn’t stop for popularity or affordability. I don’t know, Vanessa, I think there’s a fair few people (i.e. everyone) who might disagree with you. I love the way you are using your garland, Anna, and agree that the glass socket is beautiful! Is that one garland or two? 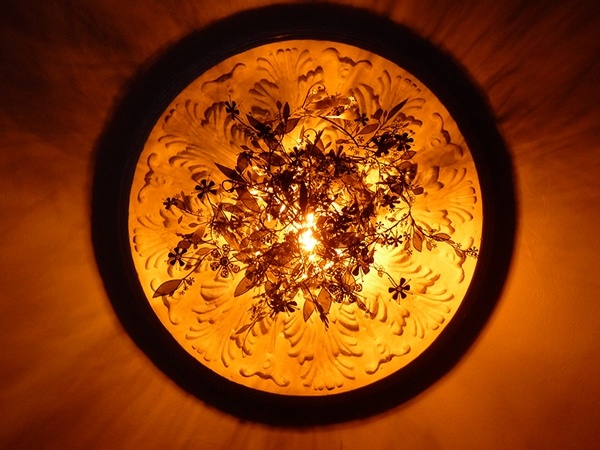 I think its just stunning and the perfect way to dress up my boring foyer fixture. This is just one Garland! Anyone calling Anna trendy? I don’t know. I feel like Anna and I could be best friends IRL if we lived nearby. 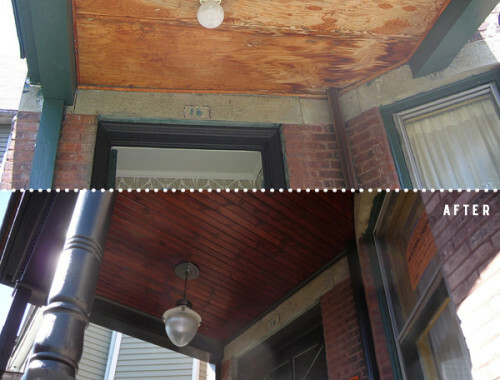 We both love old houses and restoring things. She understands why wood windows are the best! If she were trendy, she’d be putting in vinyl windows and wall to wall berber carpeting. OMG! I love this! So amazing… And, paired with the ceiling molding, just beautiful. Wow! That is so spectacularly beautiful I could just cry. Truly gorgeous pieces like that never go out of style. 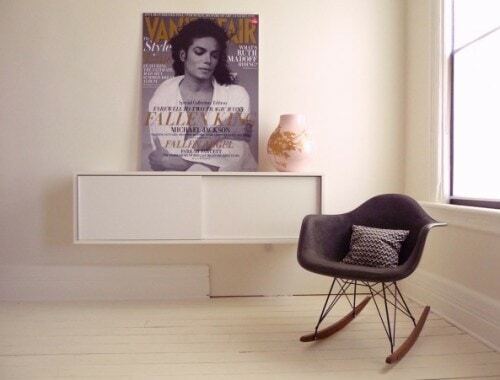 You really have a knack for setting up great vignettes in your home, and the pictures are always fantastic! Looks great mounted to the ceiling plate — so much more substantial. I’ve been wanting this for awhile. It looks beautiful! you are amazing! ive been working on several of my own home renovations and ‘upgrades’. and find yours quite inspirational! thank you! After having seen these in the store and wondering how they looked, yours just looks fabulous! that is so beautiful Anna, well done! I know you have closed the comments on Michael Jackson, but I just found your site….very inspirational. I wanted (needed) to say that I too am so very sad about the loss of this great entertainer. I was on vaction when I heard the news from CNN and thought for sure that Michael would be revived – he’s too young! However, the tragic news was then reported that he was gone…I couldn’t believe it! I read through all of the comments on your MJ post and felt comforted by 99% of the writers – it was like therapy reading other comments and realizing that I wasn’t alone in my thoughts and feelings. Last night I was browsing the internet and stumbled onto Michael Jackson’s videos and interviews on youTube. I stayed up entirely too late but I just couldn’t stop watching and learning. I have always supported MJ and will continue to defend him. And after watching all the interviews – I’m even more convinced that he was a gentle soul. On one interview, Michael stated that he preferred being around children because they were innocent – he could see the face of God in them. Watching the videos last night was inspirational because MJ had such fatherly love for all children, he knew they were the future. It was important to him that the children knew they were loved, so that they could in turn, love themselves and others. His work with underprivileged and cancer stricken children was heartwarming. What a positive difference he made in their lives. Again he preferred being with children because he had been tricked, abused, and hurt by adults….repeatedly. I know that MJ was extremely frustrated with the media – all he was trying to do was entertain and use his celebrity status/music to reach people for the good. Just listening to his lyrics was proof of his passions! I’m so disappointed with the media on many levels. (For me, this is just about the last straw.) After the media built him up – they tried to knock him down with a vengeance. Again, I think MJ felt hurt and severely shocked by all the accusations – not to mention the embarrassment of the trials – all he was trying to do was make the world a better place. Showing true courage and integrity, Michael tried to explain things – to set the record straight – and to do this meant that he was trying to let the world know what was being falsely reported/accused. Whether the reporting was on his skin disease, his surgeries, his personal life, or his three children the media felt it was all “fair” game…but truly, is it really anyone else’s business? Again, another example of the media taking the amendments too literally and therefore causing yet another tragic event. When will this abuse end? I think Michael Jackson was an exceptional humanitarian, philanthropist, father, son, and entertainer. I’m still so sad for the world’s loss. Super lovely! Tord Boontje was actually my neighbour in Peckham a few years ago, when he still lived in London…Unfortunately, I never got to see him..
Fabulous drama. Outstanding use of the Boontje light. I am surprised to see the Benedict light, though. The originals (?) are still being made and my neighborhood hardware store sells them for about $3 each. (This is in Bushwick, Brooklyn.) They are slightly different, actually a bit sleeker looking. How curious. Oh my god this is rocking my face off! I don’t like fussy complicated furnishings and decor. SO WHY HAVE I COMPLETELY FALLEN HEAD OVER HEELS IN LOVE WITH YOUR LIGHT!!!??? It is absolutely incredible, and I want one for my twelve foot high ceiling. Definitely a fantasy at this point in time – but I have added it to my ‘wish list’. This is definitely one of the coolest Lighting projects! Was it hard to do? What a wonderful story telling piece. That Toord light is one of our favorite pieces in our house. Everyone always comments on it! Nice to see it just hanging from the ceiling since ours in on a cord. i thought you’d appreciate this bit of exciting news seeing as you understood the pain and frustrations involved in getting the thing up: the light bulb my garland is wrapped around blew the other night. i want to cry! Beautiful! I have it in white, and I did NOT arrange it as well as you did. I think Josh wants to keep it in the divorce, which is fine with me, so long as I can get a new one to arrange PERFECTLY this time!